Here in Texas, we have a state test named STAAR (State of Texas Assessments of Academic Readiness). Texas is not unique, all states are required to have some form of standardized testing nowadays. This isn’t new either, in fact, as a 33 year old woman, I grew up taking the CAT test (in NJ) and the TAAS test (the old version of Texas standardized testing). Also not unique in Texas is how contentious the topic of state testing has become nowadays. Educators and Parents alike struggle with how to balance the importance of a well rounded daily education with “teaching to the test”. If I had a nickle for every time I have heard this colloquial term brought up anytime a discussion of public education comes up, I’d be rich. Some parents are (understandably so) fed up with standardized testing. 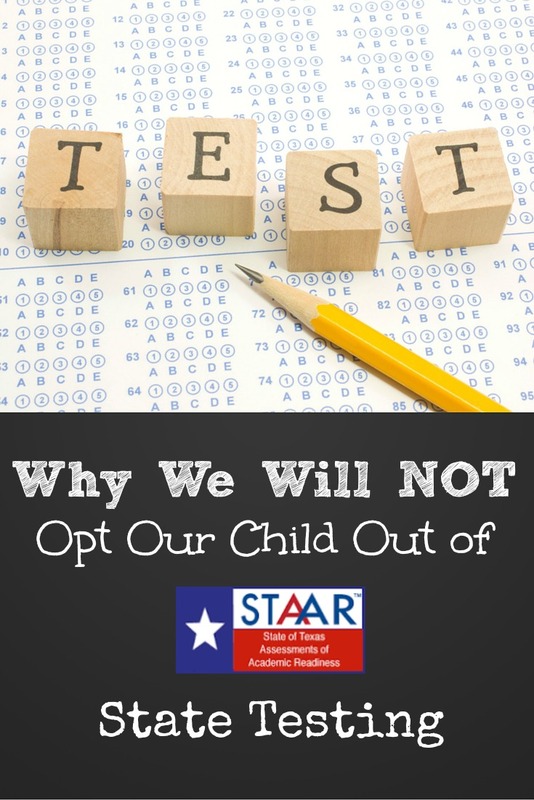 Here in Texas (and perhaps elsewhere), there is a movement for parents to pull their children out of school on STAAR testing days (and the subsequent make up days) to “Opt-Out” of STAAR testing altogether. It undermines public education at the local level – your local school cannot stop state testing. The school itself can not “opt out” of giving the test. It gives “the test” even more power – There will be push back. It won’t be as simple as keeping your child home. You will have to arm your child with the reasons why you have decided to keep them home. They will be asked. Your fight will become their fight. Are you ready for that? More importantly, are THEY ready for that? It is uncomfortable for your child – In some cases, opting out could be MORE uncomfortable for your child than having them just take the test. They have been hearing about this test all year. They might have to field uncomfortable questions from their peers and their teachers that they are not prepared for. Refusing to participate is not going to have the impact you might think it is – there are more effective ways to fight against state testing. When you vote for political candidates, are you looking at their views on education? Are you finding out where they stand on state testing? Are you writing to your local and state representatives? Are you participating in PTA/PTO? Are you pulling your child out and not advocating for ALL children? The majority WILL NOT OPT OUT. Your opposition doesn’t speak loudly all by itself. It sends the wrong message to our children – This goes back to undermining public education at the local level, but even deeper. I would say it undermines the student/teacher relationship. Now, your teacher might have no issue with you pulling your kid out of state testing. However, your child’s teacher has a job to do. Part of that job is prepping his/her class to take this test. Unless you plan to pull your child out of school completely, they are going to be “prepped” to take this test. They are going to be told it is important. They are going to learn the test taking strategies. They are going to put in the WORK for this test. Your child and their teacher are working towards something here. A common goal. This is important. This is how your child learns grit. This is how your child learns that sometimes we do the hard things and this is how your child learns to see things through. 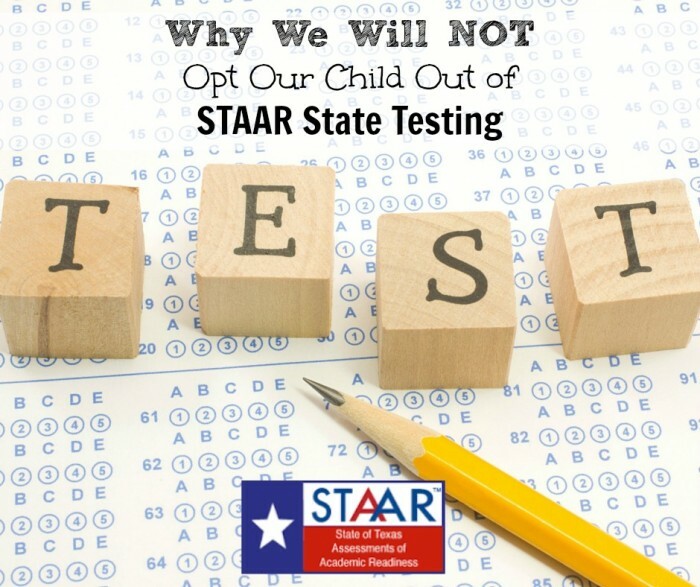 Now, to backpedal a bit here, I am not a strong supporter of STAAR testing (or rather, the emphasis placed on state testing). I once heard that the data received from state testing is useful, it’s how that data is then used that can cause issues. This makes perfect sense to me. I had state tests growing up and they caused me (and my peers), little to no stress. These were also mandatory tests, but they were NOT high stakes tests. The data was important, but it wasn’t a noose around the neck of the school. State testing CAN be done without “teaching to the test”. However, due to the federal No Child Left Behind Law (NCLB) schools are forced to “be accountable” which is where this heavy focus on state testing comes into play. I will set my child up for success. – A good night’s sleep, a good breakfast and some tasty snacks. I will encourage him – I will tell him that I think he’s going to do a GREAT job. That it is just like any other test. I will tell him I’m proud – because I am! I will praise his achievement, before his scores ever even get tallied up. I will support his teachers and his school – Sometimes support comes in the form of just showing up. I will support his teachers and his school – By advocating for ALL children with my vote, with my time spent on advocacy, and by continuously educating myself. What do you think? Do you opt your children out of state testing? I let my kids take it, but I really don’t agree with it. My kids score high, so it isn’t about that for me. It’s about the ridiculous stress they put on the children. When your very smart child is terrified of how poorly they will do something is wrong. There is a huge difference in “Oh, here’s a fun test to see how smart you are just for fun!” and “You have to learn all this and do well or else.” We’ve had to write encouraging notes to our kids to be given each test day, given several notes home about what to feed our kids and when to put them to bed, how to stress the test. It’s too much. Every school has forms you can use to opt out, the schools just won’t tell you, and few will willingly give them unless you insist. Why are they so terrified of your kid missing the test that they will hunt you down if your kid isn’t in school the morning of? I had a standing dental appointment that I had set up 6 months prior, and they freaked out because I kept my child home for it. Insane. Yep, I basically feel the same! Our school is very “low hype” for it though. So I am very thankful! (en franÃ§ais) !!!!! !- %@Â¤dthjg#rÂ£ (en arabe), suivi d’un clic et de « touuuu, touuuu, touuuu, touuuuu » !!!!!! »Bref, on n’a jamais su la suite de la procÃ©dure. Heather, I love this post! I think you make an excellent point about siding with the local school and looking for ways to advocate for all children, not just one’s own, whether or not you think testing is a good idea. Thanks for sharing!